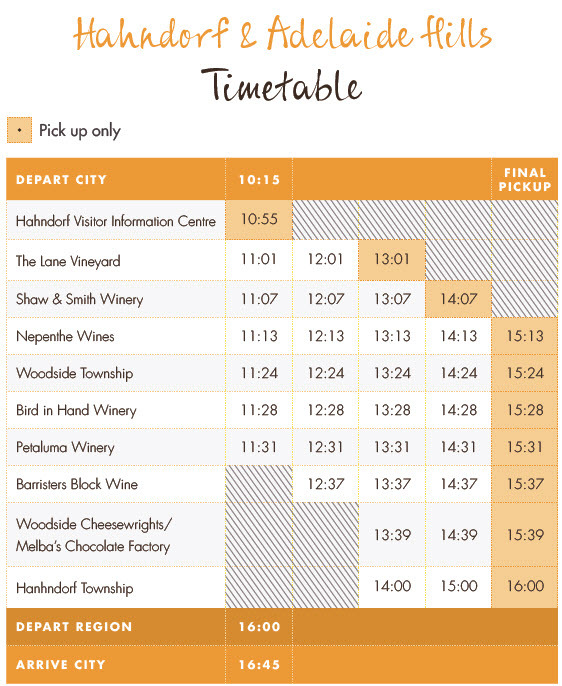 Trail hop around the historic town of Hahndorf and the Adelaide Hills on this Hop On Hop Off wine tour. Enjoy the freedom and flexibility to explore the region at your own pace. This is the best way to experience the best wineries and gourmet food experiences on offer without having to worry about drinking and driving. With careful planning you can visit up to 4 locations in the one day on the regular scheduled buses that transport you around the region. The hop on hop off bus will depart from the Hahndorf Visitor Information Centre with regular buses scheduled throughout the day. Spend some time in the town of Hahndorf, Melba’s Chocolate Factory or Woodside Cheesewrights or The Lane Vineyard. To secure your spot on this popular today book online today! Hop on or off at any stop along the way with the flexibility of staying at each destination as like as you desire!